I am a divorced woman for four years now and was granted custody of our 12 year old daughter. I am currently in a relationship and have plans of getting married soon. My partner and I have been living together for five years now. The divorce I obtained overseas is not valid here in the Philippines,what should I do to make my previous marriage null? Please advise,thank you. In a case where two people want to end their marriage, but have no grounds for annulment. does the case above means that obtaining citizenship from another country can allow a person (thru divorce) to be free of this marriage in the phils., and be allowed to re-marry again? Please correct me if i'm wrong in my interpretation of the case. Thanks. Please take note that in this case, only one of the parties acquired a foreign citizenship while the other party remained a Filipino. That former Filipino (now a naturalized citizen of another country) then filed for divorce against the Filipino spouse. THe Supreme Court said that the divorced spouse (the Filipino citizen) can now remarry in the Philippines, because it would be against the spirit of the law and the intention of Congress if this divorced Filipino spouse is not allowed to remarry. As to the former Filipino citizen who filed for the divorce, he or she can get married here in the Philippines, no longer as a Filipino but as a foreigner. Please take note however that if it was the Filipino spouse who filed the divorce action against the former Filipino citizen, then that divorce will not be recognized here in the Philippines and that Filipino spouse cannot remarry here. I am divorced in Taiwan and had my divorce registered in the Phil.Economic Council in Taipei. If I wanted to get married again how should I get the license? Do I have to go to a Phil court to make this divorce valid or is it already valid? I would like to marry my fiancee here in the US. I've been separated with my ex wife for nearly 9 years but was never annulled. I am planning on filing for divorce here in California. I am however not sure if I should declare that we have kids together on my divorce papers. My ex-wife has our kids and I no contact with them since we separated. If I declare no minor on my court papers, will I encounter any problem? Will the US government find out that I have kids? I know that it'll be much more complicated if I declare that I have kids. Thank you so much. 1. As a Filipino citizen and since you are the one initiating the divorce, your divorce in California will not be recognized here in the Philippines. 2. In the Philippines, as well as in the US, there are laws on perjury or lying under oath. If you declare that you do not have kids when you actually have them, that is lying under oath. 1. You are an American citizen and your law allows divorce, unlike here in the Philippines which does not recognize divorce. 2. What kind of a church wedding did you have here in the Philippines? Sine you were already married in the US under American law, any marriage here in the Philippines would really be a mere reenactment (at best) or a sham (at worse). Under the Family Code, foreigners who want to get married here in the Philippines are supposed to obtain a Certificate of Legal Capacity from their consulate or embassy. That California license has no legal effect here in the Philippines. Did you check with the National Statistics Office (NSO) if ever a marriage certificate was ever filed with it with your names on it? You can check with the NSO through its online services; try to get a CENOMAR (Certificate of No Marriage). If there is no marriage confiscate with your names on its file, the NSO will issue the CENOMAR. If there is a marriage certificate with your names on the NSO files, it does not really matter since you are American citizens but it will create a potential mess should you get married again. 3. Are you a Filipino citizen who later on acquired American citizenship? Or are you a natural-born American citizen? If you are a natural-born American citizen, and you wish to acquire Filipino citizenship, you would have to give up your American citizenship and go through the naturalization process. But as an American citizen, you can get married here in the Philippines. You will be asked to present to the Local Civil Registrar a Certificate of Legal Capacity from the US embassy here in the Philippines. If you are a Filipino citizen who later on became an American citizen, then you can avail of RA 9225. As to whether you can get married again, that is a gray area. RA 9225 is a relatively new law and there are problem areas. For example, can a person who holds dual citizenship file for divorce as a foreign citizen when the Family Code prohibits or does not recognize divorce? The issue here is, can a person who holds dual citizenship under RA 9225 invoke American citizenship when it is convenient or pragmatic for him or her? Or can this person invoke Filipino citizenship when it is more convenient or pragmatic? Please take note that Section 5 of RA 9225 states that holders of dual citizenship shall be subject to all attendant liabilities and responsibilities under existing laws of the Philippines. If your marriage and divorce took place when you were already an American citizen, then your case will not be on all fours as in the Orbecido case decided by the Supreme Court as I discussed in this post. That will mean that as an American citizen, you will be able to get married here or anywhere else for that matter. In the Orbecido case I discussed above, the situation was that the spouses were married when they were Filipino citizens. Later on, one of the parties became a US citizen and then filed for divorce. The other party (still a Filipino citizen) then wanted to get married here in the Philippines. 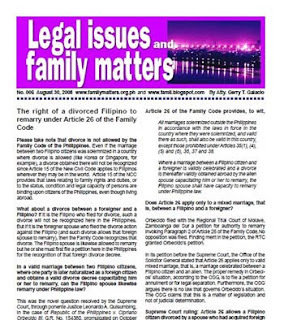 When the case reached the Supreme Court, it ruled that this “divorced Filipino” had the right to remarry under Article 26 of the Family Code. Correct me if I am wrong but you got your divorce when you and your wife were already US citizens. This makes your situation different from the Orbecido case. If you can get a Certificate of Legal Capacity from the US embassy here when you plan to get married again, that would seem to indicate that you are legally capacitated to get married again (as an American citizen, that is). HOWEVER, I am aware of some instances when the US embassy denied petitions for immigration when the facts of the previous marriage and divorce became known (that is if you are planning later on to bring your future wife to the US). As I said, if you are planning to take advantage of the dual citizenship law, there are undecided legal issues involved. We were both Filipino when we acquired our marriage license here at a local city hall in Japan. I was a permanent resident here at the time of marriage. I later became a naturalized Japanese citizen but our marriage didn't last long and we eventually filed for divorce here. Will the Philippine law recognize our divorce? 1. You obtained your divorce when you were already a Japanese citizen. If and when you get married again here in the Philippines, you will be required by the Local Civil Registrar to submit a Certificate of Legal Capacity to contract marriage from the Japanese embassy or consulate before a marriage license is issued. 2. I will assume that your ex-spouse is still a Filipino citizen. If you were the one who initiated the filing of the divorce action, then your ex-spouse will have the right to remarry under Philippine law. However, your ex-spouse must first file a petition in court here in the Philippines for the recognition of the divorce decree. If your ex-spouse was the one who initiated the filing of the divorce action, then the divorce is not recognized here in the Philippines. Your ex-spouse cannot therefore remarry. (You, on the other hand, can remarry since, as a Japanese citizen, you are no longer covered by the Family Code). i just acquired a divorce decree here in the UK and been a naturalised citizen of this country,I have read some here that in order for the filipino spouse to remarry he has to apply a petition for our decree to be recognised,my question is can I apply for this petition to the court myself or do I have to wait for him to apply?And if so where do we start? 1. Please clarify: When you got your divorce, were you already a UK citizen? If yes, then you are no longer bound by the Family Code of the Philippines. 2. Is your husband still a Filipino citizen? If yes, then if your husband wants to remarry, under Philippine law, he must file a petition in court here in the Philippines for the recognition of the foreign decree of divorce. Since you are already a UK citizen, you do not have to be involved in this process anymore. thank you for your response,I am indeed the one who filed the divorce and that time am already a UK citizen, my only concern is our records in NSO,if he did not file the divorce decree then I am still married by records,is that right or not?sorry am so confused, that's why I wanted to file it myself as I can already foresee that he will not do it. if ever what are the procedures to follow,and documents needed?Do I need a lawyer?Please fill me in. 1. You are correct that if your spouse did not file a petition in court for the recognition of the foreign divorce decree, then the records at the NSO will show that you and your spouse are still married. 2. Since you are already a UK citizen, then the Family Code no longer applies to you. If you want to get married again here in the Philippines, then what you need (for the Local Civil Registrar to issue a marriage license) is for the British embassy here to issue a Certificate of Legal Capacity to contract marriage. The problem however is that there will now be two marriage certificates in your name in the NSO files. As a UK citizen, you do not need to file a petition for recognition of the foreign divorce decree. What you can file is a petition in court requiring the NSO to annotate on its records that your marriage has already been terminated. However, before taking any court action, you can try to clarify matters with the NSO itself through its legal department. The NSO website is www.census.gov.ph (you can also ask the lawyer who handled your divorce to write the NSO attaching to the letter a true copy of the divorce decree). Please take note that all these are necessary only if you want to get married again here in the Philippines. Like I said, as a UK citizen, you are no loger bound by the Family Code. I am an american who married an older filipina 12 years ago(its a shot gun wedding because my business was astake). We had been seperated for a year and I am planning to file a divorce when I go back to the states next year. My question is she had been threating on having me and my new gf thrown out of prison if i dont leave my new gf and go back with her. She is also Threatening of killing both of us. I want to know about the law on Infidelity againts a foreigner husband. Hope you can help. Thanks in advance! Please read my article titled “Adultery, concubinage and psychological violence” also in this blog. Look for the link in the sidebar. The laws I mentioned apply to anyone regardless of citizenship. Im currently legally married with a Filipina. Living in Americas as a green card holder and soon will file my citizenship.We got married Nov 2003 and she left for Icland Jan 2004. We finally call it quits when we had bitter arguement before her vacation May 2004. My questions is, if i become Naturalized US citizenship and filled divorced after my citizenship. DO I NEED TO FILE FOR ANNULMENT? How will i file my Divorce paper to Philippines so i can remarry again or do i still need to file my divorce paper or not? I read in one of the issue that all we need is for Divorce lawyer to send copy of divorce paper to NSO and ask US Embassy for a copy or certain paper that would issue of my right to remarry again in philippines now as an American citizen. Let us discuss the issues one by one. 1. A divorce obtained by Filipino citizens abroad will NOT be recognized here in the Philippines. 3. What if an American gets married here in the Philippines to a Filipino citizen? Does it mean that he or she cannot divorce the Filipino spouse since divorce is not allowed here in the Philippines? That American (or any foreigner for that matter) can file for divorce in his or her country (or any other place in the world) since his national law allows divorce for him or her. 4. A Filipino citizen married to a foreigner : If the divorce is filed by the foreigner against the Filipino citizen and such a divorce allows the foreigner to remarry, then the divorce will be recognized here in the Philippines under Article 26 FC. What the Filipino should do is to file a petition on court here not for annulment but for the recognition of the foreign divorce decree. Once the court grants the petition, it will order the NSO to make the proper annotation on the marriage certificate concerned. If the divorce is filed by the Filipino citizen against the foreigner, then the divorce will not be recognized here in the Philippines. This is true even if for example the ground for the divorce was spousal violence by the foreigner against the Filipino citizen. This may sound harsh and unjustified BUT the problem really is that these Filipinos got married to foreigners without knowing what Philippine law (especially Article 15 of the New Civil Code) provides. 5. What about a divorce for example in Singapore or Korea or Taiwan or Japan? I am told that in these countries, all the foreigner and the Filipino spouse have to do is go to the City hall, file the divorce papers and then get the divorce decree within the same day. I have not read a specific Supreme Court ruling on this situation, but my reading of Article 26 of the Family Code is that such a ”consensual” or “mutually-agreed upon divorce” will not be recognized here. The idea behind Article 26 is that the Filipino citizen is the aggrieved party, that is, the divorce action was filed against him or her by the foreigner-spouse. In a ”consensual” or “mutually-agreed upon divorce”, it cannot be said that the Filipino was the aggrieved party. 6. What about if a Filipino becomes a naturalized citizen of another country and wants to remarry here in the Philippines? 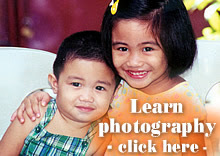 Since he or she is no longer a Filipino, the Family Code no longer applies to him or her. What should he or she do considering that the marriage certificate of his previous marriage is still on file with the NSO? My personal view is that once the former Filipino citizen is issued a Certificate of Legal Capacity to contract marriage by his embassy or consulate under Article 21 of the FC, then he or she can remarry here in the Philippines without fear of possible legal consequences. If ever a case of bigamy is filed, the defense can be raised that a divorce had already been granted to the naturalized citizen and that the second marriage was entered into not by a Filipino but by a citizen of another country. The possible mess will be of two marriage certificates then being on file with the NSO. Can the naturalized citizen just send to the NSO a copy of the divorce decree? Possibly, but the NSO generally requires a court order for it to do anything like annotating the records on its files. Solution? Any party in this kind of situation can, before getting married, ask for the opinion of the NSO or the DOJ just to avoid potential problems later on. As far as I know, the NSO does not have internal rules or guidelines on this issue. I am naturalized British citizen and I would like to divorce my wife, we get married in the Philippines while we still Filipino citizen, can you tell me what to do. Am I allowed to get divorced and re married again. As naturalized British citizens, you and your wife are no longer covered by the Family Code. Thus, you can avail of British divorce laws. I am a Filipino citizen and my Bf is now an american citizen..But before we are committed he is married to a filipino citizen and they get married here in the Philippines after he got his citizenship in the US he filed a divorced to her ex-wife because his wife here in the Philippines found another man, which his ex-wife and the man are now in staying in one house and they already have a daughter. Now he is already divorced in his country to his wife her in the phil., now we are planning to get married we he come home here or in hongkong on june 2009,..are we commiting grounds?..or can the ex-wife have the right to file a case for me for the bigamy? because we get married and their marriage is not yet annulled..can we get marry here in the philippines? Pls.help me..thank you so much in advance.. Your boyfriend is no longer a Filipino citizen. He can therefore as a foreign citizen (1) obtain a divorce against his Filipino spouse); and (2) after obtaining his divorce, get married again. Since he is no longer a Filipino citizen, there is no need to file for a petition for declaration of nullity of his marriage. The problem however is if you get married here in the Philippines, the NSO records will now have on its files two marriage certificates (the first with his Filipino wife, and the second with you). Since foreigners are required under the Family Code to obtain a Certificate of Legal Capacity to contract marriage, the second marriage certificate will indicate that he is no longer a Filipino but an American citizen. 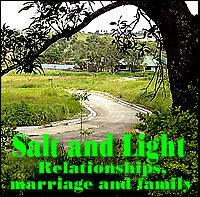 Please also read my Salt and Light blog posts titled “Biblical grounds for divorce and remarriage” at http://-salt-and-light-.blogspot.com/2005/12/divorce-and-remarriage_26.html . Please take note that second marriages have a higher percentage of failures than first marriages. Meaning, the probability that your marriage (the second for your boyfriend) will end in divorce is greater than the probability for a first time marriage. My husband is a lebanese and we got married in the Philippines. Lebanese has no civil marriage unless obtained abroad and then it is recognized. In case of dispute, the civil court in Lebanon is competent to handle the divorce according to the court rule where the marriage took place. My husband is filing an appeal in Lebanon to handle our divorce using the Phil Family Code Article 26 & 55. Is it possible to obtain a divorce using these article mentioned? Can I transfer the case to Phils. where I will be well represented as I can't afford the expenses in Lebanon? Thank you. Article 55 is not for divorce but for legal separation. In legal separation, the marriage ties remain (meaning, despite the grant of a decree of legal separation by the court, the man and woman will still remain married). Article 26 refers to the right of a Filipino citizen to remarry upon being divorced by a foreign citizen. As to whether it can be used as a basis for divorce in Lebanon (or in other countries which do not have civil marriages), that issue has not been brought up to the Supreme Court. You should consult either the Philippine embassy or consulate in Lebanon, OR a Lebanese lawyer for the answer to your questions. I am a Philippine citizen previously married to a US citizen, marriage held in the Phils. In 2004, my US spouse filed a successful divorce against me in Guam USA - which has been authenticated by the Phil. Embassy there. The Phil. Embassy in Guam informed me that I was free to remarry since the alien spouse filed the divorce. In 2006, I remarried to an EU citizen in Hongkong which was not a problem since they recognized my US divorce docs. At present we live in EU, all docs are recognized and authenticated with Apostilles. However upon reading your blog, I was not aware that I needed to have the US divorce recognized in the Phils. Should I have done this process before remarrying? Am I going to be charged for bigamy in the Philippines? Please advise. What the Philippine embassy in Guam told you is only partially true. Since the divorce was filed against you by your foreigner-spouse, then you are allowed to remarry under Article 26 of the Family Code. HOWEVER, what the Philippine embassy in Guam did not know is that for purposes of remarriage, you should have filed a petition for recognition of the foreign divorce decree BEFORE you married your present husband. You mentioned that the embassy in Guam received your divorce papers. This is merely a ministerial function or duty on the part of the embassy. Meaning, the embassy does not have judicial powers; when it received your divorce papers, that is not a governmental recognition of the validity of your divorce or that you could then remarry. The Philippine government and the courts are not bound by the decisions of foreign courts. This is why a petition for recognition of a foreign divorce decree is required. As far as the Philippine government and the courts are concerned therefore, you are still married to your American husband. If you apply for a copy of your marriage certificate with the NSO (National Statistics Office), you will discover that the certificate will not have any annotation on it about your divorce decree. Your marriage to the EU citizen is therefore bigamous since you got married again without first having filed a petition for recognition of your foreign divorce decree. As to being charged with bigamy, this is a problem for Philippine legal authorities. We have a system of criminal justice which follows the rule “venue is jurisdictional.” This means that the crime must be prosecuted in the place where it took place. If the crime took place in Manila, it must not be filed in Quezon City, for example. Since your marriage to the EU citizen took place in Hong Kong, the problem is where in the Philippines should the crime of bigamy be filed? Please read this post again. As the Supreme Court ruled in the Orbecido case, a Filipino who becomes a naturalized citizen of another country is no longer bound by the Family Code. Based on the laws of that country where the former Filipino has become a citizen of, he/she can remarry again after the divorce has become final and executory. Simply stated, you are no longer a Filipino citizen; you are bound by US laws and not Philippine laws. I am a filipina married to a foreign national and we have 4 yrs old son. He wants me to file for annulment here in philippines but I told him he could file for divorce there in the US. My concern is if ever the divorce will be granted and I have a copy of that divorce decree and I need to file a petition for recognition of the foreign divorce decree. How long does it take before it recognize and how much would it cost me? And also, we have 4 yrs old son. I wonder if I could still get a financial support from his father after that. Thanks. i got married in the philippines 12 years ago, i am now a naturalized british citizen, i also have aquired back my filipino citizenship. if i got my divorce here in the uk, will my dual citizenship affect the recognition of my divorce by the philippine law thank you. Did you obtain your divorce when you were already a UK citizen? If yes, you were no longer bound by the Family Code of the Philippines. To get married in the Philippines, all you need is to get a Certificate of Legal Capacity to contract marriage from the UK embassy (no need to file for recognition of divorce decree here). But if you got your divorce while you were still a Filipino citizen, then later on you became a UK citizen and then you got dual citizenship, this presents a difficult problem. There are a lot of gray matters and unresolved issues involving our Dual Citizenship law which need to be cleared up by amendatory laws by Congress or by rulings of the Supreme Court. i am a filipino citizen and previously married to a japanese citizen the marriage took in the philippines last 2004 and the marriage was recogineze here in japan.. we got divorced last sept.of 2009 here in japan city hall... i have Us military boyfriend stationed here in japan now and we are planning to get married.. am i allowed to remarry again in the philippines or ouside the philippines? will US government recognize my divorce here in japan in order to marry a us citezen? what else will i need to do to marry a US military? I'm a Filipino married here in the Philippines year 2003 with a us citizen then one week after getting married i never saw my husband then a year after he i received a divorce decree then year 2008 the papers have been sealed by the State of Nevada and Now i met someone that is US citizen and he want to marry me am i allowed to remarry again? I have not seen the divorce decree you are referring to and so my answer will be in general terms. You need to file a petition for recognition of that Nevada divorce decree with a Philippine court. If the court recognizes your divorce decree, then that is the only time you can remarry. A)a petition for recognition of the foreign divorce decree in the Philippines? I also hold a Permanent Resident status in the Philippines, does this status make any difference relative to question A ? Thank you for your guidance and i'm looking forward to hearing from you. You and your spouse were already US citizens when you obtained your divorce. In order to remarry here in the Philippines, all you need is to secure a Certificate of Legal Capacity to contract marriage. The US embassy here, in agreement with the Philippine government, issues instead of a CLC an equivalent certification. The practical problem is that once you get married again, you will have two marriage certificates on file with the NSO. You need to clarify with the Legal Department of the NSO as to how this potential problem can be avoided. As to your question about your residency status here and remarriage, residency is different from citizenship. You should clarify with the US embassy these matters.